PHILADELPHIA — Marc-Andre Fleury put a stop to Vegas' early sophomore slump. 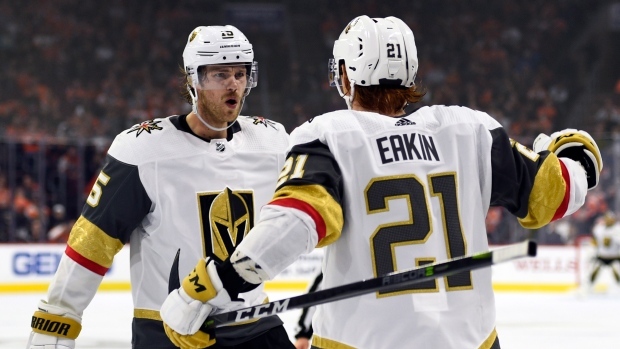 Cody Eakin bailed out the Golden Knights with the winner with 1:25 left in the game. Eakin ended the scoreless tie with a sensational sequence for the goal. He made a dive for the puck to keep it away from Flyers centre Sean Couturier in Philly's end of the ice. Ryan Carpenter snared the puck and passed it back to Eakin, who fired it from the circle past Brian Elliott for the winner. Fleury made 10 saves in the second period and all of them were worthy of retweets. He stuffed Scott Laughton on a short-handed breakaway that wiped out the centre and sent him crashing into the boards. Laughton crashed back-first into the boards and was down on the ice for a few seconds, then went straight to the locker room. He didn't return until the third . Moments after that save, Giroux was alone on a breakaway, took a nifty skip over a Vegas blade and was also stopped by Fleury. Fleury lay on his right side and snared the puck with his glove a tick before it reached the crease. Giroux's stick hop was a play-of-the-day candidate — had Fleury not topped him with the save of the month. The Golden Knights tweeted the clip with the caption, "Don't you Fleury bout a thing." NOTES: Gritty continues to get more mainstream exposure than any mascot or mortal in the NHL. Gritty taped a segment at a Philadelphia cheesesteak landmark for "Jimmy Kimmel Live !" that aired this week. "Picked up a side hustle for when Claude's on the road," Gritty tweeted . His in-game skits are a hit with fans — especially a videotaped segment that showed him taking out the trash and doing other chores around like the arena like a mascot everyman.